You may be surprised to learn that the first recurring Bounty Hunter to appear in the Star Wars universe was not Boba Fett, but a character in the Marvel Star Wars comic called “The Hunter”. Created by Archie Goodwin, “The Hunter” mirrors Goodwin’s earlier Punisher work. Goodwin’s “The Hunter”, along with some of his other Star Wars comics, appear to have been directly adapted into the character debut of the iconic Boba Fett. Merchandising visionary from the outset, George Lucas was pursuing a comic to coincide with the release of Star Wars even while still filming. After being turned down by Warren Publications, DC Comics, and initially by Stan Lee at Marvel, the Star Wars team was finally able to convince Marvel that the concept wasn’t a financial disaster in waiting. The first Star Wars Comic was released a month before the film’s release in May of 1977, and sales of the series rocketed along on the coat-tails of Star Wars’s wild overnight success. Marvel Comics had a golden goose with their new ongoing Star Wars title, which quickly moved on beyond the plot of the original movie after the first 6 issues. 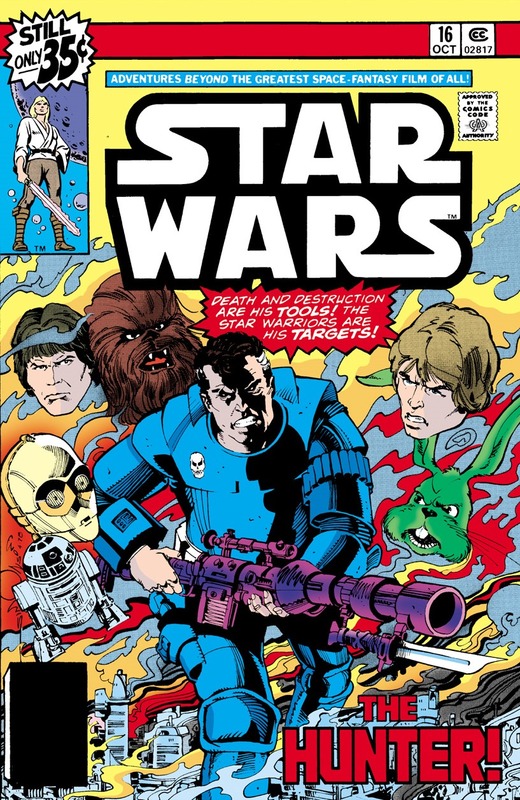 To continue the title, Marvel was allowed to create their own original Star Wars stories. Legendary Marvel writer and editor Archie Goodwin took over writing towards the end of 1977 with issue #11. A little history on Goodwin, back in 1976 Archie Goodwin penned the second feature appearance of a minor Spider-Man villain known as The Punisher in Marvel Super Action #1, drawn in black and white by Tony Dezuniga (color cover by Bob Larkin). The Punisher is a solider who’s wounded and loses his family in a mob attack, and becomes obsessed with taking vengeance on criminals. By late 1977 Goodwin was the writer for the Star Wars comic, and Tony DeZuniga also made the jump from Punisher, inking several of the early Star Wars books. Goodwin’s new bounty hunter character named “Valance the Hunter” debuted in issue 16, drawn by Walt Simonson on pencils and Bob Wiacek on inks. Valance is a soldier who’s wounded and loses his face in a rebel attack, and becomes obsessed with taking vengeance on droids. Beyond the obvious similarities in character origin stories and the covers, there were strong cues in the appearance of the character as well. 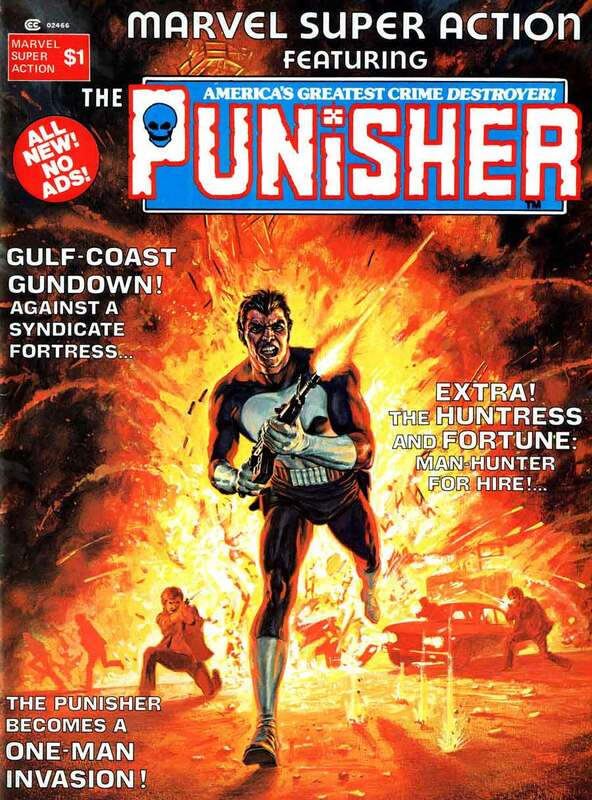 Like The Punisher, “The Hunter” also wore a skull on his chest, it was almost identical to the small skull previously used in the title logo of the earlier Punisher book. When contacted about the similarities in the character for this article, Walt Simonson responded: “I certainly had no intention of doing any Punisher related visuals… I don’t normally do character design sheets; I develop the character design as I draw the comic.” Bob Wiacek also confirms “I used the facial features that Walter gave me and worked in shadows and rendering. The Punisher was the furthest thing from my mind“. Nevertheless, the widow’s peak, arched eyebrows, and broad facial features of the characters are strikingly similar. 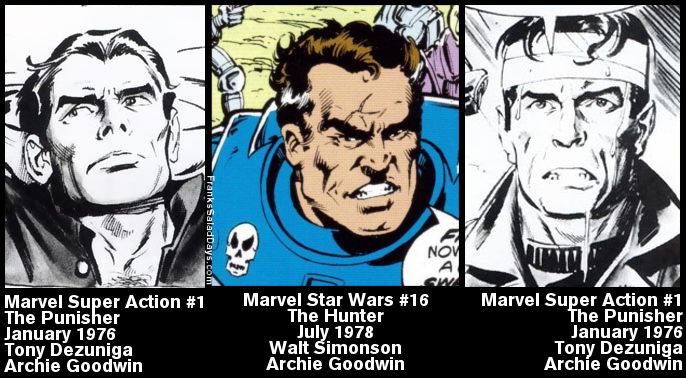 Though Simonson and Wiack may not have been intentionally referencing their fellow Star Wars artist Tony Dezuniga’s earlier Punisher art, the two characters were written so correspondingly that Goodwin and DeZuniga’s Punisher comes through strongly in the final Hunter character design. Jaxxon the Green Rabbit was Marvel’s first major original Star Wars character, and was mercifully eliminated from the title early after being ridiculed by almost everyone, including Lucas. Though Greedo was the first bounty hunter with a brief appearance in “A New Hope”, “The Hunter” was the first bounty hunter in the Star Wars universe to make a return appearance, and was the first Marvel created Star Wars character popular enough with fans to return as a recurring character. Boba Fett followed, appearing later that year. 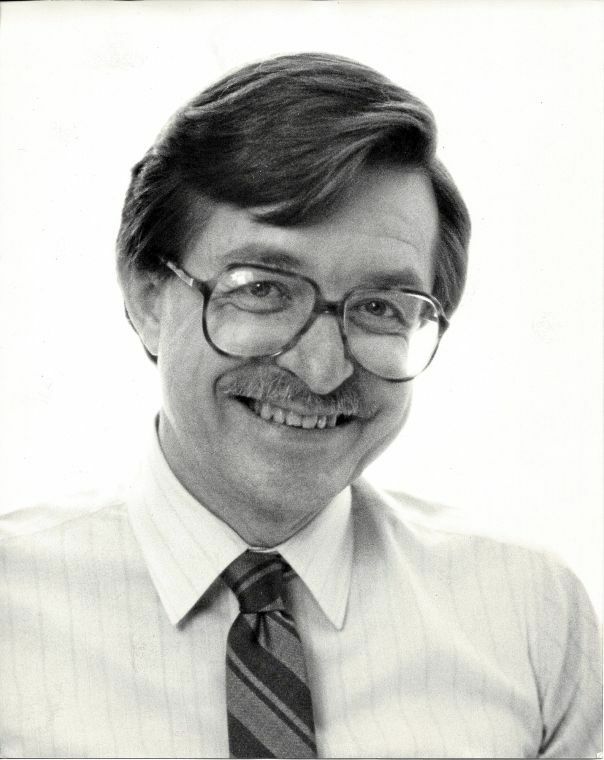 When Goodwin was interviewed on writing Star Wars, he stated that the Lucas team was content to let him create his own content, as long as Goodwin would submit a synopsis of the storylines to the Lucas team prior to book production for approval. After submitting “The Hunter” story, he mentioned that the droid prejudice storyline of “The Hunter” caused the Lucas team some pause, but they allowed Marvel to go ahead with it anyway. The title shipped in June for a July release. 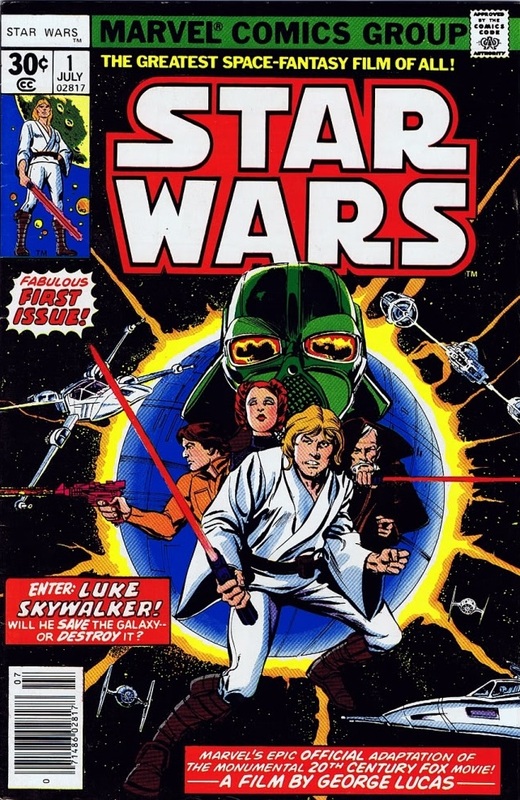 Simonson’s cover art is dated April 1978, so the story would have likely have gone to Lucasfilm for approval in January or February of 1978, if not sooner. 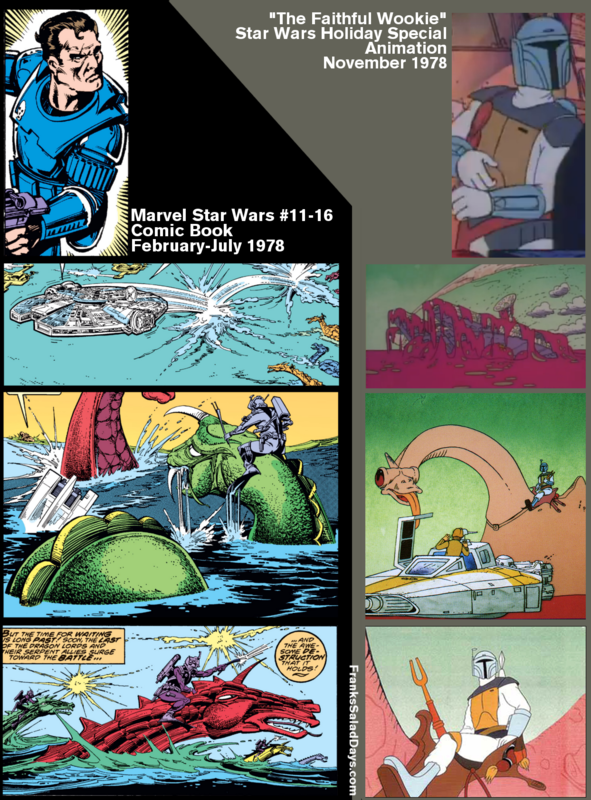 The infamous Star Wars Holiday Special of 1978 was the international introduction of Boba Fett in an animated short created for the Special by Nelvana Studios titled “The Faithful Wookie.” Either under Lucasfilm’s direction or their own intiative, Nelvana appears to have adopted several concepts and characters from Goodwin’s Marvel Star Wars comics #11-16, including a crash landing of the Millenium Falcon on a liquid planet, ocean dragon riders using forked prod rifles, and Goodwin’s bounty hunter character of “The Hunter”, now re-named Boba Fett and sporting a new suit of armor. 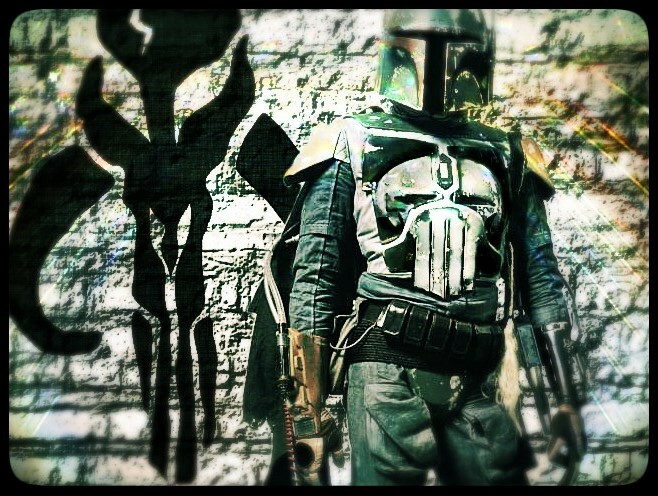 The Boba Fett name came from the April 1978 script draft of “The Empire Strikes Back” (the bounty hunters and Boba Fett did not appear in Leigh Brackett’s February 1978 first draft of the “Empire” script, but they were added by the third draft in April 1978, after Goodwin’s “The Hunter” book had been approved and begun production). The armor came from character design work already underway by Joe Johnston and Ralph McQuarrie, and in June of 1978 an all-white “Super Trooper” character model was re-purposed as Fett’s costume. This Boba Fett costume and name, along with many of Goodwin’s comic book characters and scenes from Star Wars #11-16, went to Nelvana to develop into the final animated short for the Holiday Special, released to the world in November 1978. 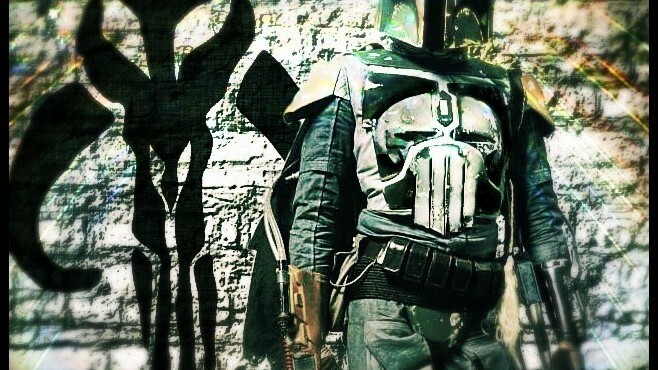 Even the shoulder patch skull for Boba Fett’s body armor bares the same characteristic jaw-less long-toothed half grin and stark oversized eyes as the characteristic Punisher death’s head. Soon after the Holiday Special, Boba Fett action figures appeared, and he became one of the breakout characters of the Star Wars universe on release of “The Empire Strikes Back”. Over the years his legend continued to grow into one of the most popular scifi characters in pop culture history. 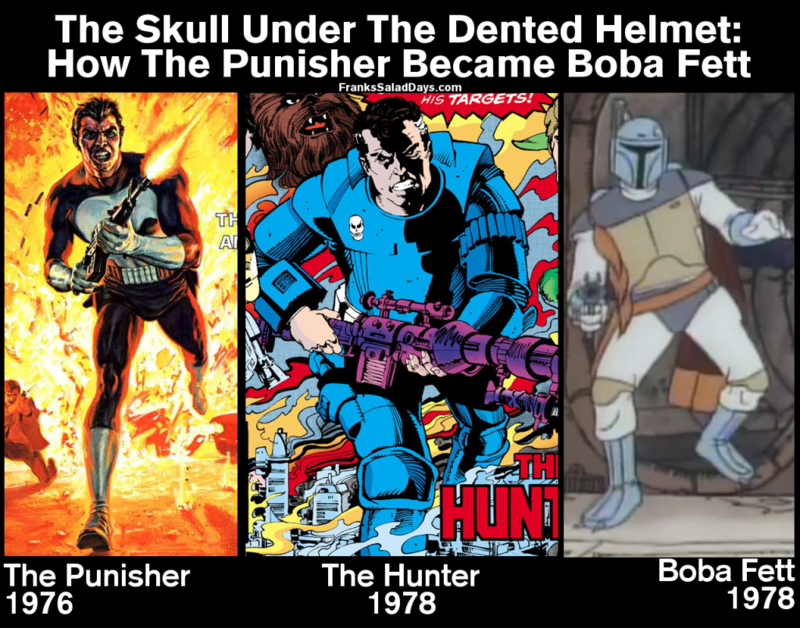 But back at the very start, in the earliest history of Star Wars in the midst of all the comics and cartoons, was that skull badge on Boba Fett’s shoulder intially the mark of The Punisher? Was the most famous gritty bounty hunter of the Star Wars universe originally the most famous gritty street vigilante of the Marvel Universe? Thank you to Walt Simonson, Bob Wiacek, Dan at Ninja Skills, The Dented Helmet Forums, Carl Potts, Lilith Wood, and Dane&Jake at Punisher Body Count.